Noise from wind turbine blades, inadvertent bat and bird kills and even the way wind turbines look have made installing them anything but a breeze. New York design firm Atelier DNA has an alternative concept that ditches blades in favor of stalks. Resembling thin cattails, the Windstalks generate electricity when the wind sets them waving. The designers came up with the idea for the planned city Masdar, a 2.3-square-mile, automobile-free area being built outside of Abu Dhabi. Atelier DNA’s “Windstalk”project came in second in the Land Art Generator competition a contest sponsored by Madsar to identify the best work of art that generates renewable energy from a pool of international submissions. 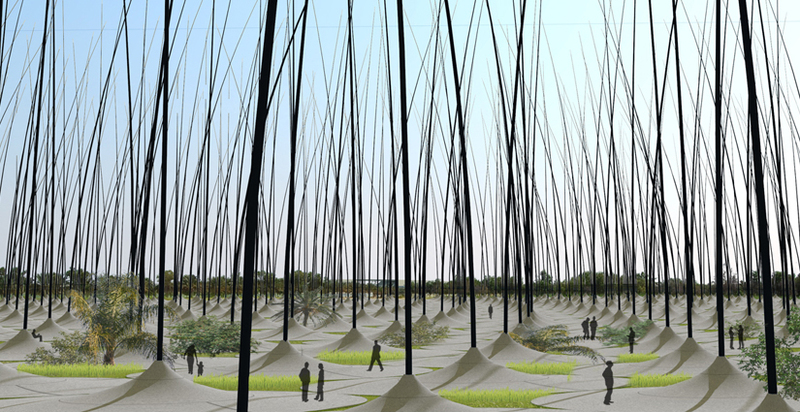 The proposed design calls for 1,203 ““stalks,” each 180-feet high with concrete bases that are between about 33- and 66-feet wide. The carbon-fiber stalks, reinforced with resin, are about a foot wide at the base tapering to about 2 inches at the top. Each stalk will contain alternating layers of electrodes and ceramic discs made from piezoelectric material, which generates a current when put under pressure. In the case of the stalks, the discs will compress as they sway in the wind, creating a charge. “The idea came from trying to find kinetic models in nature that could be tapped to produce energy,” explained Atelier DNA founding partner Darío Núñez-Ameni. 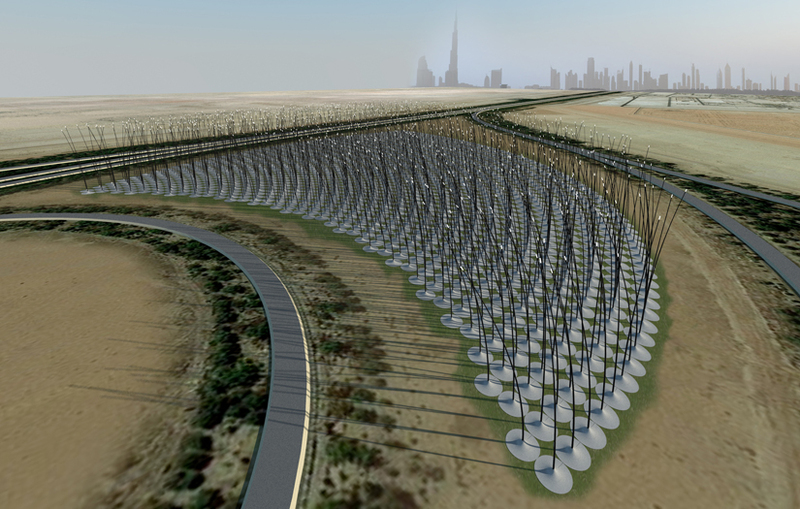 In the proposal for Masdar, the Windstalk wind farm spans 280,000 square feet. Based on rough estimates, said Núñez-Ameni the output would be comparable to that of a conventional wind farm covering the same area. “Our system is very efficient in that there is no friction loss associated with more mechanical systems such as conventional wind turbines,” he said. Each base is slightly different, and is sloped so that rain will funnel into the areas between the concrete to help plants grow wild. These bases form a sort of public park space and serve a technological purpose. Each one contains a torque generator that converts the kinetic energy from the stalk into energy using shock absorber cylinders similar to the kind being developed by Cambridge, Massachusetts-based Levant Power . Wind isn’t constant, though, so Núñez-Ameni says two large chambers below the whole site will work like a battery to store energy. The idea is based on existing hydroelectric pumped storage systems. Water in the upper chamber will flow through turbines to the lower chamber, releasing stored energy until the wind starts up again. The top of each tall stalk has an LED lamp that glows when the wind is blowing — more intensely during strong winds and not all when the air is still. The firm anticipates that the stalks will behave naturally, vibrating and fluttering in the air. “Windstalk is completely silent, and the image associated with them is something we’re already used to seeing in a field of wheat or reeds in a marsh. Our hope is that people living close to them will like to walk through the field — especially at night — under their own, private sky of swarming stars,” said Núñez-Ameni. After completion, a Windstalk should be able to produce as much electricity as a single wind turbine, with the advantage that output could be increased with a denser array of stalks. Density is not possible with conventional turbines, which need to be spaced about three times the rotor’s diameter in order to avoid air turbulence. But Windstalks work on chaos and turbulence so they can be installed much closer together, said Núñez-Ameni. Núñez-Ameni also reports that the firm is currently working on taking the Windstalk idea underwater. Called Wavestalk, the whole system would be inverted to harness energy from the flow of ocean currents and waves. The firm’s long-term goal is to build a large system in the United States, either on land or in the water. The patterns that schooling fish form to save energy while swimming have inspired a new wind farm design that researchers say will increase the amount of power produced per acre by at least tenfold. The wind turbines can do the same thing. Dabiri’s wind farm design uses wind turbines that are oriented to rotate around the support pole like a carousel, instead of twirling like a pinwheel the way typical wind turbines do. Like the fish, these spinning turbines generate a swirling wake. The energy in this flow can be gathered by neighboring turbines if they are placed close enough together and in the right position. By capturing this wake, two turbines close together can generate more power than each acting alone. This contrasts with common, pinwheel-style wind turbines where the wake from one interferes with its neighbors, reducing the neighbors’ efficiency. The vortexes occur in the wrong orientation for the neighboring turbines to capture them. For this reason, such turbines must be spaced at least three diameters to either side and 10 diameters up — or downwind of another, which requires a lot of land. Although individual carousel-style turbines are less efficient than their pinwheel-style counterparts, the close spacing that enhances their performance means that the amount of power output per acre is much greater for the carousel-style turbines. 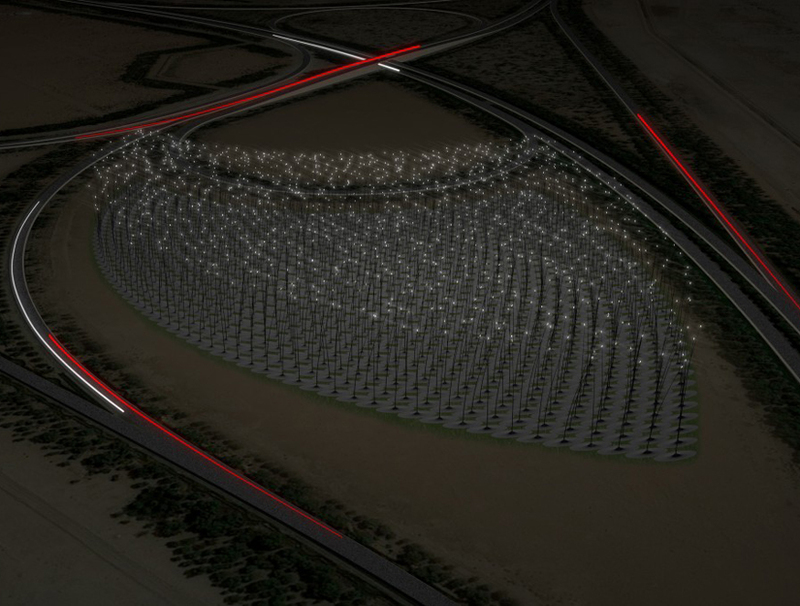 Dabiri and graduate student Robert Whittlesey calculated that their best design would generate 100 times more power per acre than a conventional wind farm. The model required some simplifications, however, so it remains to be seen whether tests of an actual wind farm produce such large gains. That will be the team’s next step. “Even if we’re off by a factor of 10, that’s still a game changer for the technology,” Dabiri noted. 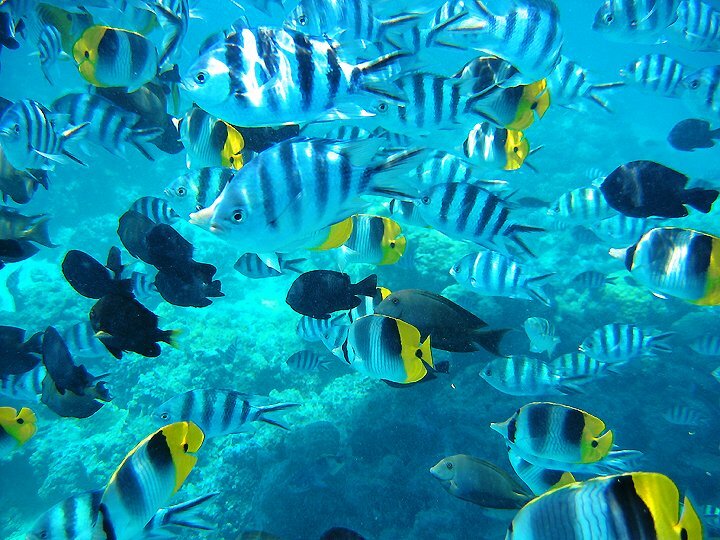 In the end, schooling fish may not have the perfect arrangement. The pair found that the best arrangement of wind turbines did not match the spacing used by schooling fish. This may be because fish have other needs to balance in their schooling behavior besides maximizing swimming efficiency. They seek food, avoid predators and reproduce, for example. “I think that this is a very interesting possibility,” said Alexander Smits of Princeton University, who attended a presentation of the findings at a meeting of the American Physical Society Division of Fluid Dynamics in Minneapolis last week. 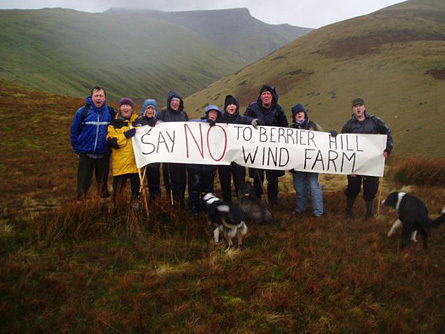 North Carolina to Ban Mountaintop Wind? Some North Carolina politicians consider this type of thing an aesthetic blight — and want to ban it from the state’s peaks and ridgelines. A furious battle over the aesthetics of wind energy has erupted in North Carolina, where lawmakers are weighing a bill that would bar giant turbines from the state’s scenic western ridgelines. The big machines would “destroy our crown jewel,” said Martin Nesbitt, a state senator who supports the ban, according to a report in The Winston-Salem Journal. As it currently stands, the bill would ban turbines more than 100 feet tall from the mountaintops. Residential-scale turbines (typically 50 to 120 feet high) could still go up, but the industrial-scale turbines that can produce 500 times as much power or more would be effectively ruled out. The legislation appeared likely to pass the state Senate last week, but got sent back to committee. Such a ban would be virtually unprecedented, according to Brandon Blevins, the wind program coordinator for the the Southern Alliance for Clean Energy, and it would make roughly two-thirds of North Carolina’s land-based wind potential unavailable. “I know of no other state that has so uniformly banned wind,” he said. State lawmakers, Mr. Blevins noted, voted not long ago to enact a renewable portfolio standard requiring North Carolina to get 12.5% of its electricity from renewable energy and efficiency measures by 2021. “Now they’re stripping away some of the most cost-effective options for their utilities” to achieve those targets, he said. “The main objection seems to be appearance, and the reality is that many people find wind turbines elegant and a symbol of a clean energy future, and that wind turbines often become a tourist attraction,” she said in an e-mail message. The North Carolina bill has roots in a 1983 law that barred most structures taller than 40 feet along the state’s ridgelines — though exceptions were made for communications towers and windmills, Mr. Blevins said. An early version of the current bill, supported by the Southern Alliance for Clean Energy, would have kept big turbines away from the Appalachian Trail and other landmarks, but granted local governments the authority to allow them in other areas. Wyoming — Walking across the former site of the Dave Johnston Mine here, about half an hour outside Casper, you’d never know that over the course of 42 years, 104 million tons of coal was taken out of the ground. But now, instead of having a heavy carbon footprint–and coal certainly does–these rolling hills have an entirely green footprint. Today, the site is home to a 158-turbine wind farm that produces 237 Megawatts of power, enough electricity for 66,800 households for a year. And what’s particularly notable about the site is that while the wind farm is among the newest and most state-of-the-art in the country today, it is also likely the first full-scale wind power project to be installed on the site of a former coal mine. From 1958 until 2000, the Dave Johnston Mine stretched for nine mines through this otherwise barren landscape. But in the late 1990s, after the mine’s operator, Rocky Mountain Power, determined that it was no longer economical to run it, a full-scale reclamation project began. As part of my road trip in 2009, I visited the wind farm to get a first-hand look at how such a scar on the earth can be successfully converted to a graceful and clean power project. A big part of the reclamation project was providing long-term grazing land and habitat for a variety of wildlife. To that end, sagebrush and many other forms of vegetation were planted throughout the property as a source of habitat and food for animals such as pronghorned antelope and deer. Further, the team behind the reclamation concentrated on habitat for birds, including building five nesting platforms for eagles and cover for other, smaller bird species. And more than 120 “rabbitats,” rock shelters for rabbits and other small animals, were built around the property. All told, the Glenrock Wind Farm is home to antelope, deer, mountain lions, foxes, bobcats, rabbits and golden eagles. While it’s easy to link the reclamation of the former coal mine and the new, giant, wind farm, Rocky Mountain Power didn’t originally set out with the intention of converting its property from greenhouse gas-intensive power to green power. Rather, the company realized after the decision was made to shut down the coal mine that the property was ideally suited to building a big wind farm. And that’s because the company already owned the property, had a significant system of transmission lines already installed nearby and understood that these rolling hills had the wind strength to support a multi-hundred million dollar wind project. But Rocky Mountain Power has by no means abandoned coal. In fact, it still has a coal processing plant adjacent to the former Dave Johnston Mine, which is one reason the transmission lines are still there. Still, the company, and other power generators, have certainly begun to see the value–and the economics–of wind farms like these. Indeed, the day after I visited the Glenrock Wind Farm, the front page of the Casper, Wyo. newspaper had an above-the-fold front-page headline trumpeting another giant wind farm that will soon be developed in the same area. My hosts for the visit to the wind farm were Chet Skilbred, Rocky Mountain Power’s vegetation scientist at the property and Doug Mollet, the director of wind operations at Glenrock Wind Farm. Skilbred explained that as part of the reclamation project, he and his team were required to replace all the indigenous plants that had been there prior to the coal mine. So, a big part of the project was the planting of 21 different species of vegetation, including warm season grasses, cool season grasses, shrubs and many more. In order to get back the remaining $2.6 million of an original $56 million bond that was put up when the coal mine was opened, Rocky Mountain Power must monitor the land through 2017 for things like ground water and surface water hydrology, wildlife and vegetation. But I have to hand it to them: If they hadn’t told me there had been a coal mine here, I never would have known. Instead, I would have been simply overwhelmed by the majesty and breadth of the wind farm (see video below, but turn your volume down because of the wind noise). Big enough to be visible from many miles away, the 158 turbines are breathtaking up close. That’s in part because, when the tips of the 125-foot-long blades are pointing upwards, the turbines are 340 feet tall. That, of course, casts a large and long shadow, and one thing that has happened is that many of the animals on the property–and no matter where we went, we would see some of the 1400 head of antelope or 600 head of deer bounding about–use those shadows to escape the intense Wyoming sun. In a sense, because there is so much new habitat for animals, as well as the fact that there is no hunting allowed on the property, the wind farm area is tantamount to a nature preserve, Skilbred said. Indeed, while there had been wildlife on the property before, life is better for them now, Skilbred said: They are no longer getting stuck in the mud inside the mine. When in operation, the coal mine was at least 180 feet deep, and nine miles long. So in order to complete the reclamation project, Rocky Mountain Power had to dig up the mine, reconstitute the soil and replant all the vegetation. 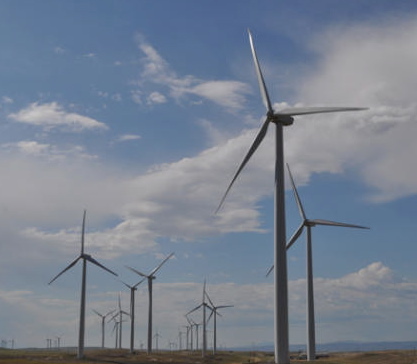 For Rocky Mountain Power, wind is just one power source, and the company sees a mixture in its future: wind, natural gas, coal and, likely, nuclear. But here, driving around amidst these giant turbines, it’s hard to think of anything but wind power. And what’s amazing is that the turbines are so big, you feel like you’re always right in front of one. In fact, however, they are a minimum of a half-mile apart, east-to-west, and 600 feet, north-to-south. Put them too close together, and the vortexes coming off the blades affects the wind flow of other turbines. The actual placement of the 158 turbines, done in what is sort of like a staggered, Z-shaped configuration, was done by turbine specialists who examined the property and developed placement models based on the terrain, the topography and the prevailing wind conditions. You might think that a company spending several hundred million dollars on such a project would expect full-time production. But that’s not realistic. Mollet said that over the course of a year, the best the company can expect is 40% average production. But of course, that’s an average. Between November and March, that number is much higher, and between late August and September, it’s much lower. The turbines, while a simple concept, are controlled by advanced electronics. And among the tasks those systems have is shutting down the turbines if the winds go above 60 miles an hour–otherwise, they can be destroyed–as well as figuring out where the wind is coming from and automatically rotating the head so that the blades are always working with the best wind. The heads can spin around three full times in search of the strongest wind, in fact, before the system runs out of wire and must reset itself. Tracking the wind is a major innovation for modern turbines. In the past, the heads were stationary, and so wind farms had limited production when the wind shifted. But now, Rocky Mountain Power and other companies with such projects can maximize the power production. Mollet said that the cost of the turbines averaged about $2 million “a stick,” and that they are intended to last for 20-to-30 years. However, Rocky Mountain Power thinks of them more as 100-year assets, given that they can replace aging systems within the turbines, or even the blades themselves. Keeping them working properly means constantly monitoring how they’re behaving in the wind. So the wind farm utilizes two types of equipment, annemometers and wind vanes to measure wind velocity and direction in order to ensure that the pitch of the blades is optimal and won’t result in them rotating too fast. This is all new technology, something previous generations of wind farms couldn’t take advantage of. But today, wind power is a growing resource and companies like Rocky Mountain Power are demanding new technology. They’re also demanding more people who know how to run and maintain these systems, despite there currently being a shortage. That’s why, for example, the company is working with local colleges in the Casper area to create new, two-year associate degree programs in wind turbine technology. Wave energy company Carnegie Corporation has been licensed by the Australian state government to explore the seabed off the southeast coast. It is the first license issued in South Australia for a company to search for suitable sites for wave-harnessing technology. Carnegie Corporation, which has demonstration wave energy projects operating in Western Australia, has been licensed to search an area covering 17,000ha adjacent to Port MacDonnell. The South Australia (SA) “coast receives a world class wave energy resource and further adds to SA’s leadership in developing renewable energy including wind, solar and geothermal,” Carnegie Corporation managing director Michael Ottaviano said. In an announcement this morning to the Australian Securities Exchange, Carnegie noted any successful site in the Southeast would be near existing power infrastructure, enabling the company to tap into the national electricity market. Australian Premier Mike Rann welcomed the company’s investment. “Wave power – like geothermal power – has the potential to provide a huge base load of sustainable energy in the future,” Mr Rann said. The license, signed today, also allows Carnegie to investigate building a 50MW wave power station. Carnegie’s CETO system operates by using an array of submerged buoys tethered to seabed pumps and anchored to the ocean floor. Suzlon Gujarat Wind Park Ltd. (SGWPL), a wholly-owned subsidiary of Suzlon Energy Ltd., has signed a Memorandum of Understanding (MOU) with the state government of Gujarat, India to develop up to 1.5 gigawatts (GW) of new wind capacity in the state. The MOU builds on the friendly investment climate for the wind sector created by the recent “Amendment of the Wind Policy 2007” announced by the Government of Gujara. Located in the Kutch-Saurashtra region of Gujarat, SGWPL will play the role of developer, facilitating permits, regulatory clearances, land, basic services and infrastructure. The MOU builds on the friendly investment climate for the wind sector created by the recent “Amendment of the Wind Policy 2007” announced by the Government of Gujarat. This development will create a good investment opportunity for customers and also create a win-win proposition for the company, customers, government and other stakeholders. La Ventosa, Mexico — On January 22, 2009 Mexico inaugurated one of the world’s largest wind farm projects as the nation looks for alternative energy, in part to compensate for falling oil production. Mexico is trying to exploit its rich wind and solar potential after relying almost exclusively on petroleum for decades. With oil production down by 9.2% in 2008, Mexico now is turning to foreign companies, mainly Spanish, to tap its renewable riches. “If we don’t do something about this problem of climate change it probably could become — I’m sure it already is — one of the biggest threats to humanity,” said President Felipe Calderon at the inaugural ceremony attended by about 1,000 residents, many of whom held on to their cowboy hats on this wind-swept day. The new, $550 million project is in a region so breezy that the main town is named La Ventosa, or “Windy.” It’s on the narrow isthmus between the Gulf of Mexico and the Pacific Ocean, where winds blow at 15 mph to 22 mph, a near-ideal rate for turbines. Gusts have been known to topple tractor trailers. Spanish energy company Acciona Energia says the 6,180-acre farm should generate 250 megawatts of electricity with 167 turbines, 25 of which are already operating. The rest should be on line by the end of the year, making the project the largest of its kind in Latin America. It will produce enough energy to power a city of 500,000 people, while reducing carbon monoxide emissions by 600,000 metric tons each year, according to the company. Esteban Morras, Acciona board member, said the project could be just the start for Mexico. “This country has great potential for wind development and should take advantage,” he said. The project is also a joint venture with Cemex Inc. and will provide 25% of the Mexican cement giant’s energy needs, fulfilling the company’s goal of using alternative fuels. Mexico hopes to boost the nation’s wind energy capacity, mainly at La Ventosa, to 5,000 megawatts — about 10 times its current output. Wind energy now accounts for less than 2% of electricity production. Energy Secretary Georgina Kessel said the government is planning a series of wind projects that by 2012 should generate 2,500 megawatts of electricity. “The intensity of wind in various parts of the country can make our plants among the most efficient in the world,” she said. But the project hasn’t been welcomed by local residents, who say they see few benefits and aren’t being paid enough for use of their lands. The mayor of Juchitan, the municipality where La Ventosa is located, attended the ceremony but called for more benefits for the local community. “We want to be part of a project that does not consider us just cheap labor but property owners and partners,” Mariano Santana Lopez said. Critics argue that foreign companies build the turbines, rent the land, run the project and produce the power for companies like U.S.-owned retailer Wal-Mart. The group is calling on supporters to “defend the land we inherited from our ancestors.” But so far it hasn’t been able to stop the project. Acciona, for its part, says the construction of the project created 850 jobs. Local residents, largely Zapotec Indians, are accustomed to foreigners’ coveting their land. The United States demanded rights to transport goods over the isthmus in the 1850s, and foreigners tried to build a railway alternative to the Panama Canal there.